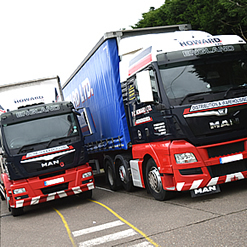 We have a longstanding history as one of the UK's leading mid–sized distribution businesses with the added benefit of freight forwarding. We offer fast and reliable door to door delivery services with a range of options including , full load , groupage and pallet services. We can collect your shipment anywhere in the UK and distribute it across the UK mainland and into Europe too. As a founding member of the Palletways Network and with Platinum status, we can also transport your palletised freight throughout the UK and the EU through its network of European members. See our Palletways Section for more details. As a 'customer service champion' we place our service emphasis specifically around our customer's needs. With significant investment in the latest IT systems, the process is well supported allowing for reliable and speedy delivery. We can also integrate our management systems with ours to offer a seamless service.